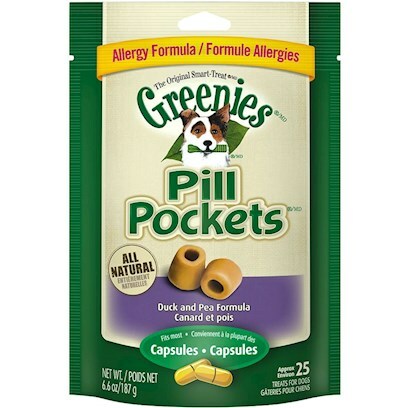 GREENIES® PILL POCKETS® Treats are nutritious, hypoallergenic treats designed by veterinarians for dogs who suffer from food sensitivities. They're the #1 veterinarian-recommended choice for giving pills. GREENIES® PILL POCKETS® Treats are made with duck, a unique protein that does not commonly cause allergic reactions, and contain pea, a carbohydrate that is easy for dogs to digest. If you or your dog isn't 100% satisfied, you'll receive your money back. Guaranteed. GREENIES® PILL POCKETS® Treats are made from highly palatable ingredients that dogs love, vitamins C and E for a healthy immune system, and a single high-quality novel protein and carbohydrate source to help reduce food sensitivities, itching and scratching often associated with common food proteins.